Former President of Nigeria, Dr. Goodluck Ebele Jonathan has said that although the Peoples Democratic Party, PDP, a platform under which he ran for a second term but lost in the 2015 elections failed to win the presidency seat, the failure however did not diminish the party. He however said that it is a clear sign that PDP will win in 2019, following the steps the party is taking now. Jonathan said this while receiving the party’s delegation who visited him at his Abuja home on Monday. The visit by the leadership and Strategy Review Committee of the Peoples Democratic Party (PDP) was to intimate the ex-President on the party’s steps towards taking back power from the now ruling All Progressives Congress, APC, party in 2019. “We lost the Presidency but that does not diminish PDP. Every other party in Nigeria also know that PDP is still the number one party.” Jonathan receives PDP delegates “I think losing the presidency is temporary; we should be able to get that position back,” Dr. Jonathan said. Chairman and leader of the delegation committee, Professor Jerry Gana while thanking the former president said that apart from meeting with leaders of the party, they would also reach out to other political parties of like minds with a view to forming a merger. He said the party had taken steps towards ensuring it emerges victorious in the coming 2019 Presidential elections. “Since the PDP is already on the ground and the All Progressives Congress (APC) has emerged, we thought we should reach out to all the other parties that are friendly with the PDP,” he said. Professor Gana also said that the committee had met with seven of the other parties, and that the National Conscience Party as well as two others have expressed their willingness to merge with the PDP. Jonathan said for a party like PDP, with true membership across all polling units, it meant that voting would take place at wards or local government levels. 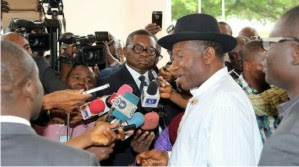 Hear Jonathan’s words: “The best way to stop imposition is to make sure that people don’t control the delegates. “How to select delegate is that at least 70 percent of the delegates should not be under the control of anybody.” Jonathan said if the party could not do direct primary, it should make sure that it increased the number of statutory delegates with people who had held elected or party offices at different levels. He said the party could come up with criteria where its national chairman, state chairmen, senators and others in offices that controlled the government were made statutory delegates. According to him, “All these group of people if they are still in the party should be automatic delegates. “These are people that are known by everybody and nobody can go and manipulate them or their names. “By the time we have a reasonable number of statutory delegates who are more than 75 per cent of total delegates that will vote, then, it will be difficult for somebody to go and manipulate the list.” Jonathan commended the committee for the report as well as the national caretaker committee under the leadership of Ahmed Makarfi. “This is the only way to strengthen political parties. It is a clear sign that PDP will win in 2019.